How Can You Make CPAP Masks Work for You? Home > CPAP Machine Toronto > How Can You Make CPAP Masks Work for You? 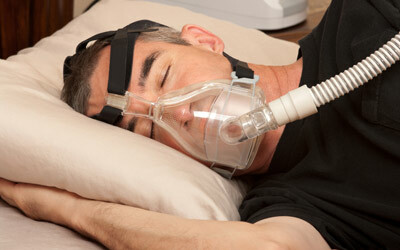 CPAP therapy is a common treatment for sleep disorders such as apnea. When used correctly, it is very effective treatment. Unfortunately, not everyone knows how to use their CPAP masks properly. No matter what kind of mask you choose, you may need some troubleshooting assistance. Luckily, for every potential problem, there is a solution. Not being able to get used to the air pressure. Users sometimes have trouble getting used to the forced air pressure – especially if high-pressure settings are involved. It’s best to use newer machines that come with a ramp feature that slowly builds up to a higher pressure over a period of time. When you first turn it on, it will start out at a very low setting. Throughout the night pressure will gradually increase. There are also some machines that come with built-in sensors that will detect when you are exhaling, and offer some pressure relief to help with the process. Talk to your CPAP supplier or doctor to find out what kind of CPAP mask would be the right fit for you. They are available in different styles and sizes. Some masks are large enough to fit the entire face, while some come with nasal pillows that fit directly under your nose. Many adjustable masks are available as well. If there are problems with the mask leaking, you won’t get the full amount of air pressure you need to fall asleep. An ill-fitting mask is usually the cause of leakiness. Either you are not strapping it correctly or tightly enough, or it’s the wrong size/shape for your face. Try adjusting it to see if you can get it to fit better. If not, then you will need a different one. If you wake up with nasal problems after a night of wearing a CPAP mask, it could be caused by air leaks or lack of humidifier. Some machines come with adjustable humidification settings. It may take a bit of trial and error, as too high of a setting could cause a runny nose. If your machine doesn’t come with a humidifier and you don’t want to invest in a new one, you could try using a nasal spray to use before bedtime and/or when you wake up. Also, make sure that the mask fits right so that there are no leaks. If you keep waking up to find the CPAP mask knocked off your face, don’t worry too much. Just make sure you put it on correctly and strap it nice and smug. If you still somehow remove it while you’re asleep, it may be because you’re not used to it yet. Keep on going to bed with it anyway. In time you should get used to it. You’ll either need to get a new one or try getting used to the one you have. Try using it during waking hours when you don’t need it, while you’re reading or checking email. Hopefully, it’ll get to the point where you’ll feel less uncomfortable with it on your face. Don’t give up on CPAP masks. It might take some experimentation to find the right one, but as long as you keep using it, you’ll start getting the rest and sleep you need.